Work with our construction partners to identify opportunities for construction trade training, with important demonstration projects that attract nonprofit and government funding. We have identified a project in Sandtown Winchester that will serve as our initial effort. Year One Progress: Selected a project in Sandtown-Winchester/Upton and formed Fan LLC to oversee the development of a mixed-use training center. Year One Progress: Participated in BLocal BUILD College. Employ two summer Interns in 2016. We have hired summer interns in the Mayors Summer Youth Program in two of the past five years. This year we will hire two young people to work in our office and learn about our industry. Year One Progress: Hired two summer interns in 2016. Increase our spending by $100,000 in the targeted zip codes. Currently, BCT spends $550,000 locally per year for vendors, consultants, and professionals whose offices are in the Baltimore targeted zip codes. Due to an additional $1.5 million spent outside of Baltimore City, we believe we can increase that number by $100,000. Year One Progress: Increased spend by $150,000, exceeding the target by $50,000. Although our practice is predominately outside of the Baltimore region, we are aggressively “buying local” when we consider new vendors, benefit providers, and other service providers to take advantage of the talents in Baltimore and to keep more spending at home. Year One Progress: Continuing efforts to buy local. Our mission is to design vibrant, inspiring, sustainable buildings and places that promote positive social interaction within their communities. 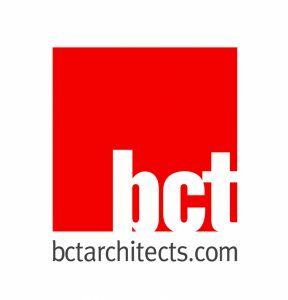 BCT is a creative, multi-disciplined design studio specializing in all aspects of masterplanning, architecture, interior design, and environmental graphics. While the nature of our practice is constantly evolving to reflect the trends, values, and technology of our world, we are recognized as leaders in the design and planning of vibrant districts and mixed-use projects incorporating retail, restaurant, residential, hospitality, senior living, and workplace components. Throughout each stage of our growth and development, we continue to hold true to our original values, committing ourselves to the design and creation of dynamic environments that promote greater quality of life. Headquartered in downtown Baltimore, BCT is at the center of a dynamic Creative Class community on the U.S. East Coast within easy travel of 50 million people. Our 50-person firm includes architects, planners, interior designers, and other design professionals.